I won't go into too much detail in my rationale for initiating these purchases, thereby expanding my positions in Altria and Iron Mountain. My first Seeking Alpha piece fully hashes out why I believe Altria is currently an attractive investment. In short, the company's dividend is the highest it has been in years, I have confidence in the company and its ability to transform itself for the next half century of dividend increases, and I also detail the appealing current valuation. As for Iron Mountain, I wrote a brief overview of why I initiated a position in it back in October. Since that time, the company announced a respectable 4% dividend increase. Overall, the company has delivered on my investment thesis since I initiated the position and rewarded me with an inflation beating dividend increase. The valuation was also attractive as my cost basis of $32.03 on the previous 3 shares I owned, only increased to a cost basis of $32.09 with the addition of the 4th share. 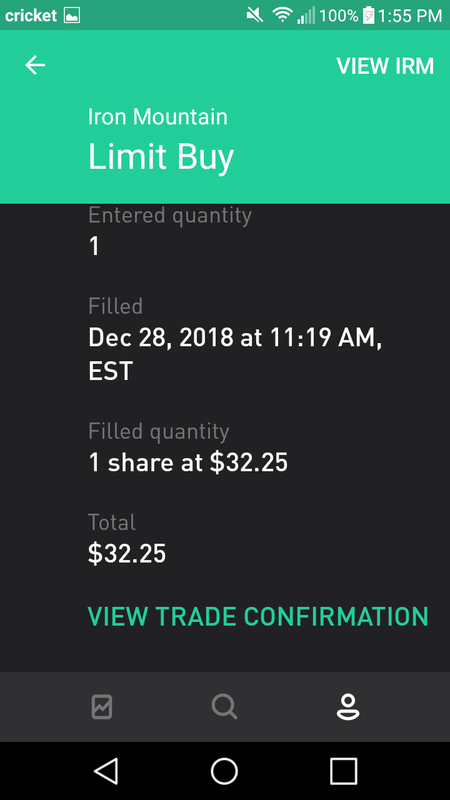 I'd like to continue to add to my Iron Mountain position as long as the price stays in the low to mid $30s, unless other more attractive buying opportunities present themselves. Overall, these two small purchases increased my forward annual dividends by $5.64. 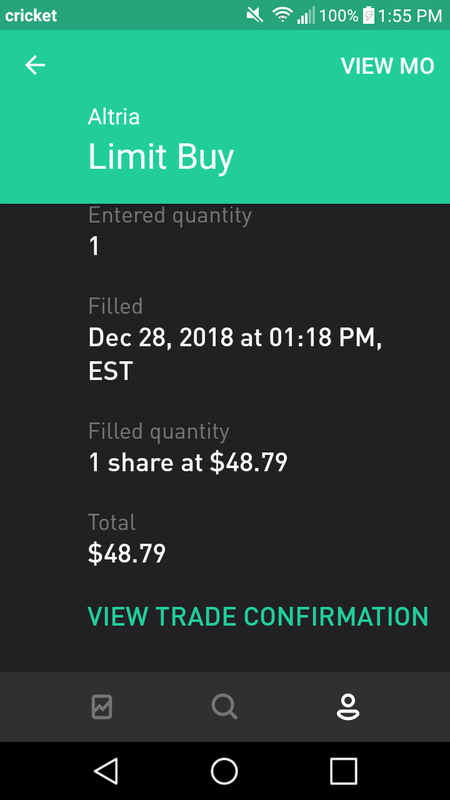 I deployed $81.04 in capital to my Robinhood account, at an average dividend yield of 6.96%. 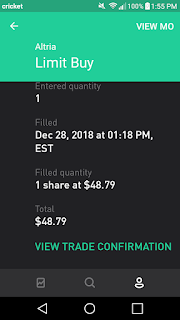 Factoring in my retirement contribution on the same day, that places my dividends going into 2019 at just over $470! 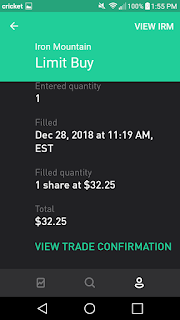 This will also continue to help me make progress in balancing out my dividend income as both Altria and Iron Mountain pay dividends in the first month of the quarter, which has historically been my weakest month since the inception of the portfolio in September 2017. Have you added either of the two names mentioned above? Or have you been adding other names? If so, what did you purchase in the last days/weeks of 2018? I really like both of these purchases, and have added to MO relatively recently as their price took a hit. While I know they have been beat up about how much they paid for their stake in both Juul and Cronos, I think both moves are great for the long-term. Btw, just followed you on SA. It looks like you're getting great engagement on your articles as well! I also believe that while Altria probably did overpay to acquire Juul and Cronos, this was a necessary move on their part, to diversify away from the dying, tobacco business. I believe these moves will fuel the next half century of dividend increases. Thanks for the follow on SA. I've certainly enjoyed the process of writing at SA: from the research, to the engagement and testing of an investment thesis, and the added income that makes it a decent side hustle is a nice bonus! Both are excellent stocks and will pay dividends for years. Absolutely! A couple of what I believe to be wonderful businesses at fair or better valuations. If the concept works for Buffett, I think it will work well for us! As far as the pun goes, that's one all of us DGIers can appreciate. That is some serious dividend income added right there Kody. I own IRM but not MO. I like MO's joint venture a lot and it seems to have helped solve a problem facing most of the big tobacco companies (As user habits continue to change). Thanks for the comment, Bert. Although I think MO overpaid a bit for their recent acquisitions, it was really just the cost of doing business, in my opinion. Those acquisitions should definitely drive the next half century of dividends.